Okay, it's been a busy week. You've had work, errands, housework, the kids had a thousand places to be. You barely had time to make dinner. However, here you are, Super Bowl Sunday and YOU HAVE NO SNACKS!!! What are you going to do!?! You HAVE to have snacks for the big game! Don't worry, I bet you can find everything you need to whip up a FANTASTIC Nachos Supreme in no time! Just head on over to your pantry and fridge and I'll show you what I'm talking about! Next place a skillet over a medium/high heat. Add 2-3 tbsp. of oil. Now you can start to really amp up the flavor! Break up the ground beef with a rubber spatula and stir so that everything is well coated in the spices. Cook until the ground beef has browned and and is no longer pink, about 10 min. Okay, so you know when you use a taco seasoning packet you add water to create a sauce. Well we are going to apply that same principle here. However, water really doesn't enhance the flavor any so I thought why not use the liquid from the can of diced tomatoes and chilies. You will get the liquid you need to create a lovely sauce and you will get the added flavor of the tomato and green chili. So pour the liquid from the can of diced tomatoes and green chilies into the meat and spices and let it reduce by half. Since we are using refried beans from a can you are going to need to wake them up a little bit. Pour (or plop lol) them into a small sauce pan. Add a splash of water to the pan, stir it around, and heat over medium/high heat until smooth and workable. Now it is time to bring is all together! You are going to need a baking sheet and cover it with foil. Place the tortilla chips, in a single layer, on the baking sheet. On a side note, you don't have to use this type of chip. You can use nacho chips, fritos, whatever you desire! That is part of the fun of pantry cooking. It is whatever you have on hand. Now you can dollop the warm refried beans around the baking sheet, on the chips. Next, sprinkle the saucy beef over the chips. Place in the 400 degree, preheated oven for 5 minutes. When you pull it out of the oven the nachos are done, but they aren't supreme! Sprinkle the diced tomatoes with green chilies over the nachos. Then top with sour cream, sliced black olives, green onions, cilantro, whatever you like. You are not going to get anything like this at a restaurant or fast food place! I can't resist. I MUST take a bite! So good! 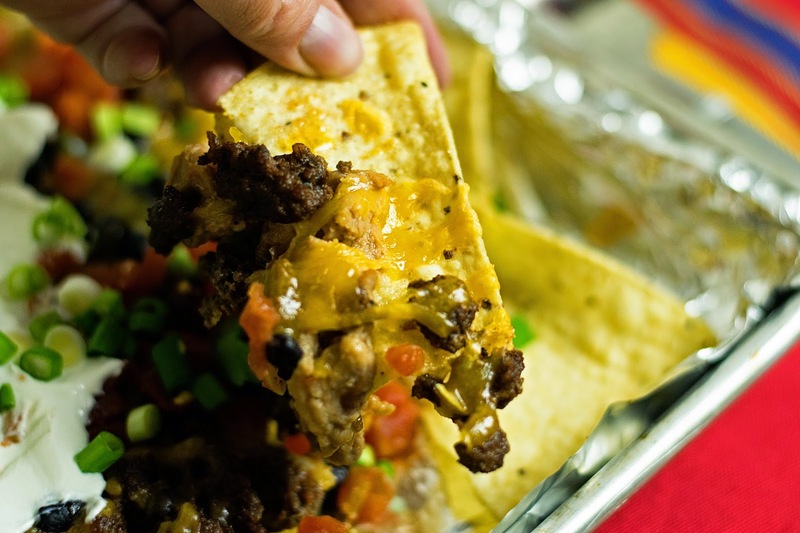 Crunchy, salty, spicy, cheesy, beefy, creamy, tart, EVERYTHING your game day nachos should be! 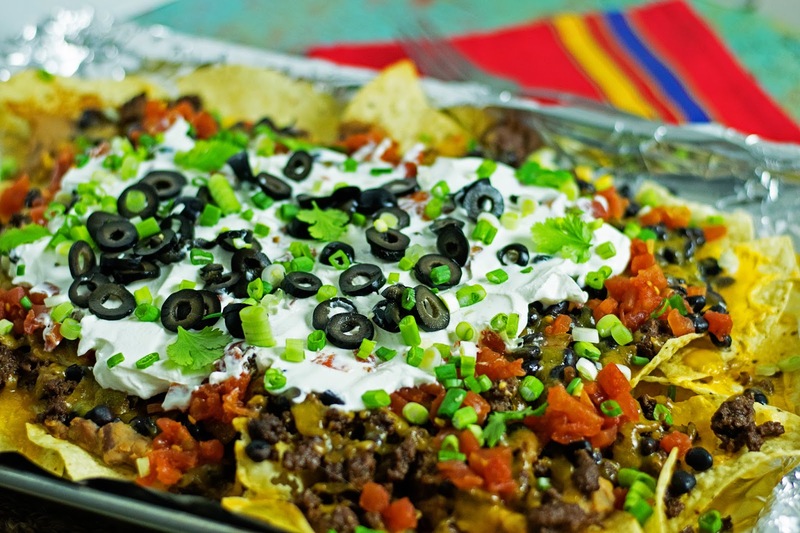 These nacho are so scrum-dil-icious that NO ONE will guess that you threw it together at the last minute and you, my friend, will be the MVP in the eyes of all your friends and family! So head on into the kitchen and give this Nacho Supreme a try. Next place a skillet over a medium/high heat and add 2-3 tbsp. of oil. Add the ground beef to the pan and season with salt, pepper, onion powder, oregano, chili powder, cumin, and smoked paprika. Break up the meat with a spatula and stir until all of the meat is coated with the spices. Let the ground beef cook until brown and there is no more pink, about 10 minutes. Add the liquid from the diced tomatoes and green chilies to the skillet and let reduce by half to make a sauce. Heat the refried beans in a sauce pan with a splash of water until heated through and smooth.